The technology, art, and science of online advertising. Pay per click (PPC) is an Internet advertising model used on websites where advertisers pay a predetermined fee only when their ad is clicked, not each time their ad is displayed. With search engines, advertisers typically bid on keyword phrases relevant to their target market. Content sites commonly charge a fixed price per click rather than use a bidding system. Advertisers typically setup ppc campaigns on a PPC network and define how much they are willing to spend for each click that their campaign receives. Advertisers select keywords, keyword phrases, keyword groups, or categories in which they want their advertisements to appear. Cost per click (CPC) is the sum paid by an advertiser to search engines and other Internet publishers for a single click on their advertisement, which directs one visitor to the advertiser's website. Bidding in PPC campaign is the process where advertisers who are willing to spend the most money for a relevant advertisement get listed first on the publisher's website. *Google's PPC ranking system assesses CPC (cost per click), ad relevance, click through rate, and daily budget, so the order on which the ads appear is based on a number of factors. In the bid-based model, the advertiser signs a contract that allows them to compete against other advertisers in a private auction hosted by a publisher or, more commonly, an advertising network. Each advertiser informs the publisher of the maximum amount that he or she is willing to pay for a given ad spot (often based on a keyword), usually using online tools to do so. The auction plays out in an automated fashion every time a visitor triggers the ad spot. In contrast to the generalized portal, which seeks to drive a high volume of traffic to one site, PPC implements the so-called affiliate model, that provides purchase opportunities wherever people may be surfing. It does this by offering financial incentives (in the form of a percentage of revenue) to affiliated partner sites. The affiliates provide purchase-point click-through to the merchant. It is a pay-for-performance model: If an affiliate does not generate sales, it represents no cost to the merchant. Variations include banner exchange, pay-per-click, and revenue sharing programs. When you setup a PPC campaign you can control the traffic. While a new website takes time to rank well in search engines, with PPC you can turn the traffic on and off. With PPC you can create almost instant traffic. 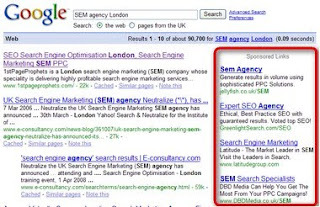 Unlike organic search listings you control the information (i.e. description) and where the visitor is directed on your website. Another benefit to PPC listings is the opportunities for international exposure. Organic search listings vary in different geographical regions. With PPC you control where you are seen. Fraud has plagued PPC advertising medium since its inception, and while many PPC networks have made significant progress in combatting click fraud, it is still something to be cognizant of. In order to determine how effective a PPC campaign is, it is important to implement tracking. Just because an advertisement has a high number of click throughs does not mean it is the best ad. It is easy to get users to click on "Free Software" but few of those clicks will convert to sales. A successful PPC campaign should be targeted not too narrowly and not too broadly. Direct the user to a relevant landing page that has a direct relationship to the keyword or phrase. Kwesi Steele is Head of Industry at Google Canada. He leads the team responsible for the sales and service of some of the most rapidly growing and exciting digital advertisers in the country. How can you use advance advertising reports?